Phew! March and April sure were busy months on the ‘out and about’ front for Hololabs. In March we went to the Game Developers Conference in San Francisco and were selected to represent Canada in the Canada @ GDC Canadian Video Game Showcase. It was fantastic, and we very much appreciate all the support we had from Telefilm Canada while we were down at GDC. 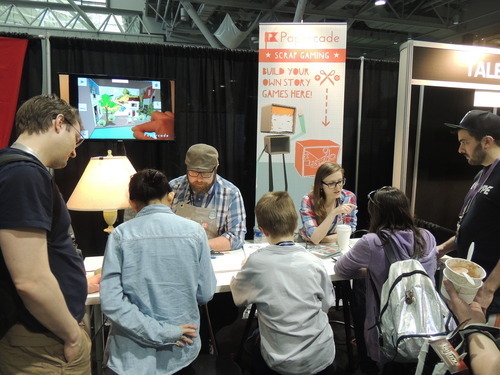 A few weeks later, in April, we had our very own booth at PAX East to show off our first playable version of Papercade. It was incredible seeing so many different people using Papercade and loving it! We had a blast and were even included in Applied Gaming and Gamerwife's PAX East recap posts! All this has us very excited, and we can’t wait to get our beta version up and running so even more people can try it out. So, on that note, friendly reminder that if you are interested in joining the closed beta test you can sign up on the website any time.